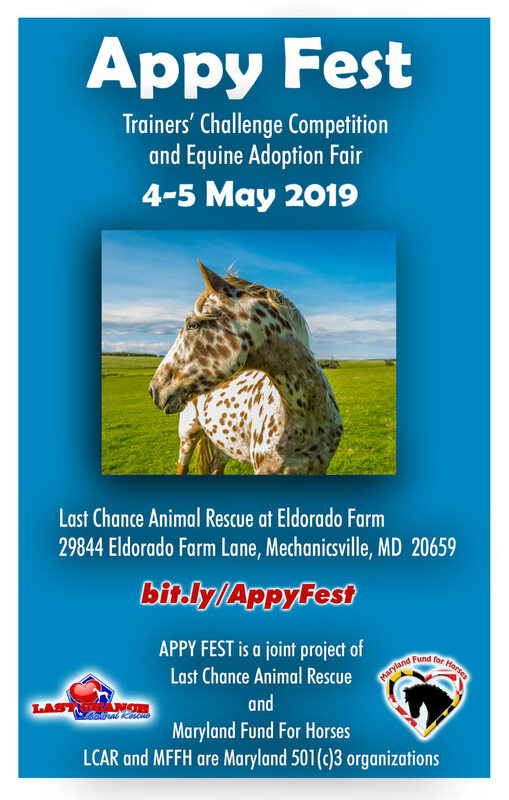 APPY FEST is a free, family-friendly spring festival celebrating the healthy, happy Wicomico Appaloosas, bringing them to a place where prospective owners can meet them, fall in love, and adopt them. APPY FEST includes a Trainers’ Competition, Horse Adoptions, Equine Demonstrations, plus shopping, food, face-painting, and PONY RIDES. So come out to the show May 4-5 and see the horses, shop, and enjoy the lovely spring weather. There are over 20 horses and foals available for adoption from Last Chance Animal Rescue of various ages, sexes, and level of training. Review the available horses at PetFinder and download and submit an adoption form. Fund our trainer stipends — paying a stipend to trainers makes it possible to get these horses the highest quality professional training, which we find to be the key element in successful adoption placements. 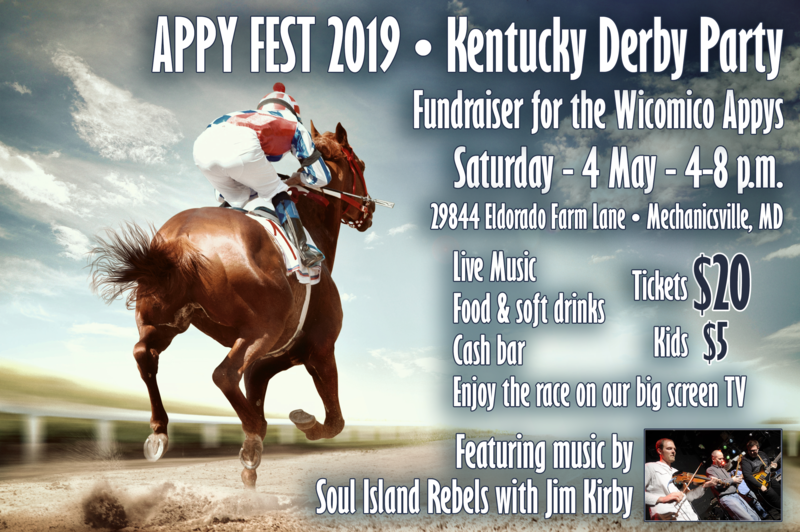 Fund the expenses for the Appy Fest event – everything from preparing the farm to host the show, to ribbons, prizes, and promotional expenses, to equipment rentals and other incidental expenses. Your donation will make these horses’ hopes for wonderful homes a reality, and make a great weekend for us to cheer them on. On March 31, 2018 over 100 starved, feral horses were seized from a farm in Wicomico County, Maryland. The horses were placed with rescues throughout the Mid-Atlantic area, and since then their recovery has been nothing short of miraculous. Last October, we were thrilled by the success of the first AppyFest, which united 15 Wicomico horses with adoptive homes. Most of the remaining horses have received professional training, preparing them for adoption. The next stage of their transformation is finding loving, permanent homes. We are looking for volunteers in advance of the show and for setup, teardown, and running all activities during the show – signup today and join the fun! Are you a trainer or affiliated with a rescue? There are still horses left who are yet to be placed with a trainer and it’s not too late to claim your appy to compete in APPY FEST. Visit the trainer’s challenge page for the application form, trainer’s contract, and FAQ. The Hilton Garden Inn offers discounted rates for APPY FEST attendees. Mention Last Chance Animal Rescue when making your reservations. APPY FEST provides a unique opportunity to showcase your merchandise and services at a family-friendly event with up to 1,000 spectators and participants. We invite vendors to participate in APPY FEST by displaying handmade crafts, art work, toys, gifts, jewelry, equestrian apparel and equipment for sale, along with local businesses, services and associations. Please note: this is an outdoor venue. Have something different in mind? Contact us. Maryland Fund For Horses welcomes Business Sponsors to APPY FEST. We want to connect you with our audience and increase brand awareness of your goods and services. Let’s talk about how we can customize a sponsorship specifically for you to maximize your impression and interaction with APPY FEST attendees.